Updated Angular to 5.2.9. Updated Module/Angular CLI Dependencies. Updated cordova-plugin-device (1.1.4 => 2.0.1). Updated cordova-plugin-splashscreen (4.0.1 => 5.0.2). 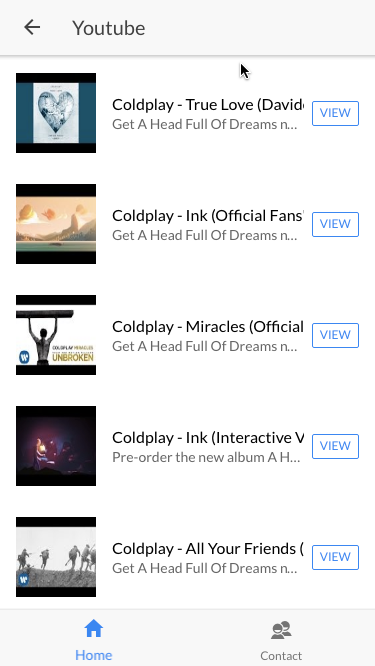 Updated cordova-plugin-inappbrowser (1.6.1 => 2.0.2). 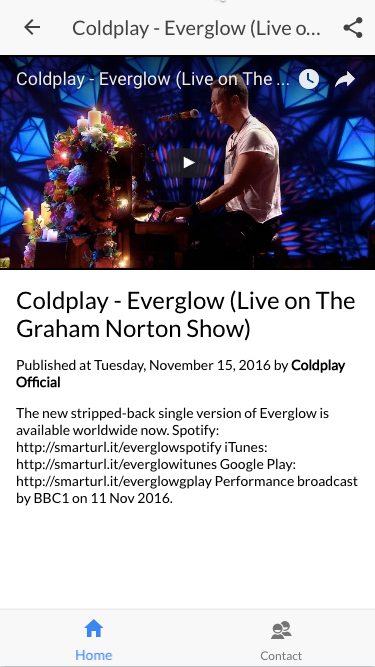 Updated cordova-plugin-x-socialsharing (5.1.5 => 5.3.2). Updated phonegap-plugin-barcodescanner (6.0.5 => 7.1.1). Updated Ionic Framework to 3.9.2 and Angular to 5. Updated Module Dependencies. 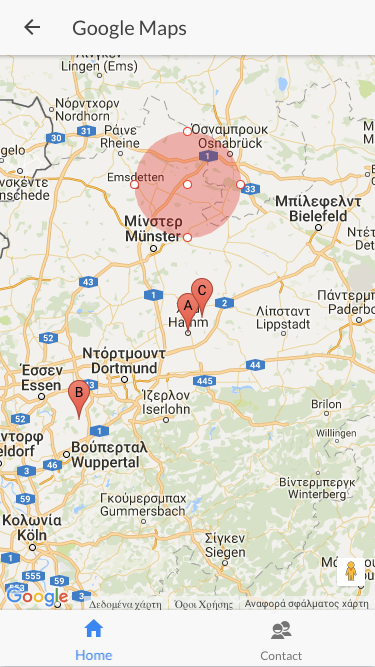 Implemented Angular Google Maps (AGM). 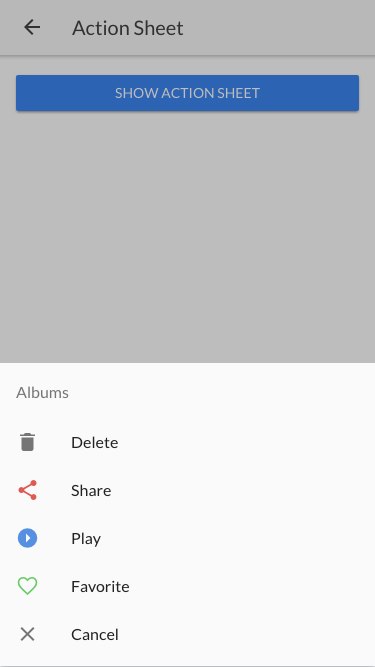 Fixed Firebase (Facebook Login) Photo Url issue. Removed multiple unused imports. Updated ng2-translate to ngx-translate. 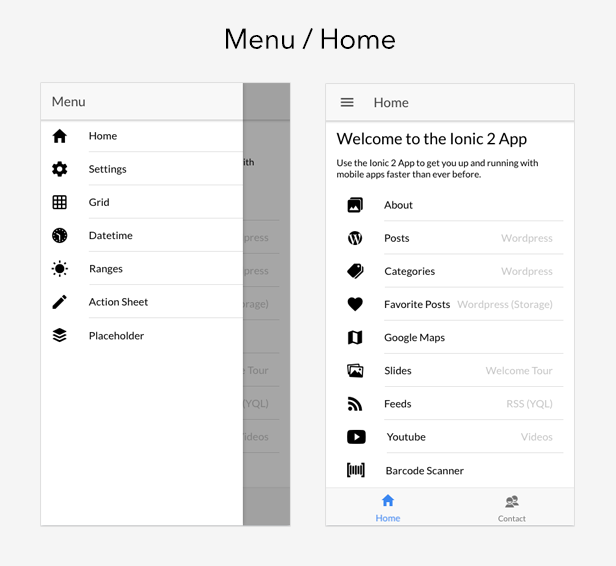 Updated Ionic Framework to 3.7.1 and Angular to 4.4.3. Updated Module Dependencies. Filter Wordpress Posts by Author (Linked Author). Home Wordpress Page integration. Updated Ionic Framework to 3.4.2 and Angular to 4.1.3. Updated Module Dependencies. iOS (tap) fixes. 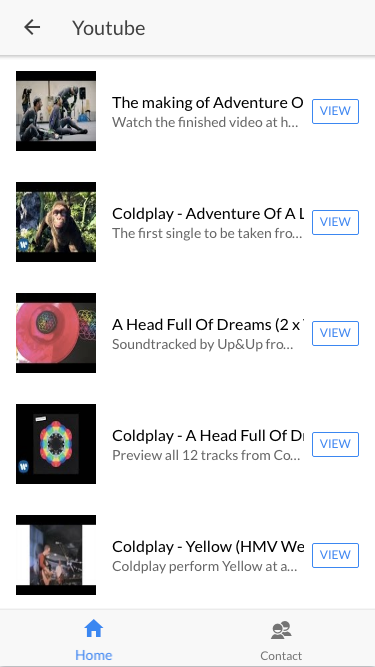 Firebase 4 integration. New Firebase Module, Firebase Home, Firebase Login, Firebase Sign Up, Firebase Reset Password Components. 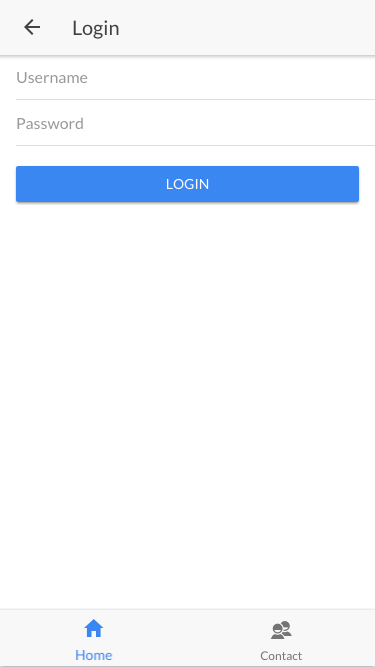 Firebase Authentication/Login with Email/Password and Facebook Sign-In Methods. Firebase Logout. Firebase New User (Email/Password) Registration. 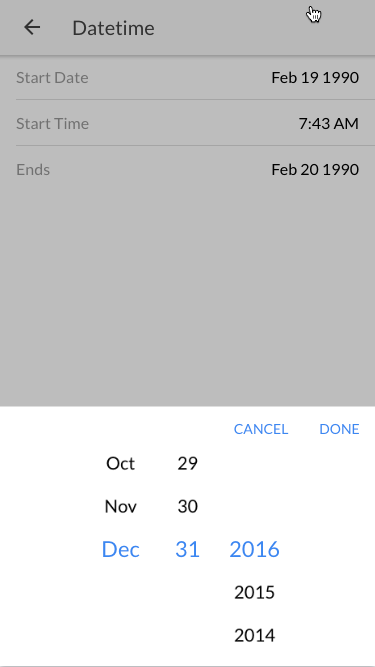 Firebase Password Reset Email functionality. 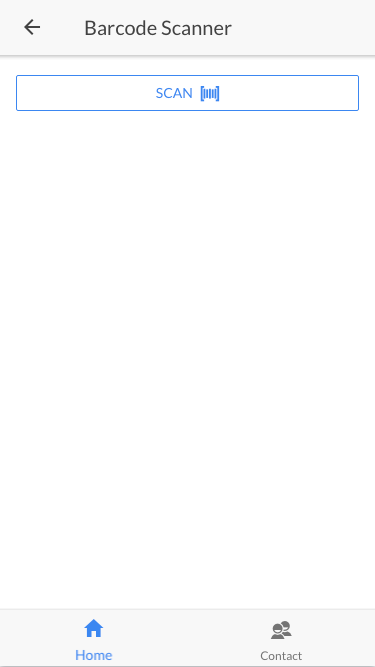 Firebase Detailed Documentation. Wordpress Tags integration. 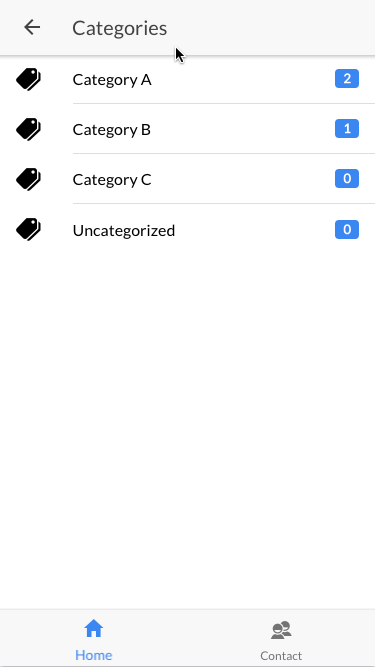 In App Wordpress Tags integration in the Wordpress Menus. Ionic Framework update to 3.2.0 and Angular to 4.1.0. 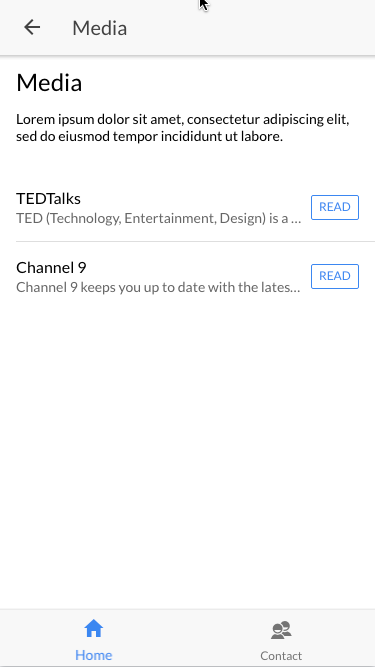 Ionic Native update to 3.6.1. Ionic app-scripts update to 1.3.7. Fixed double fire event in the Social Sharing action. Several updates/fixes. Ionic 3 + Angular 4. Ionic Framework update to 3.0.1. Ionic app-scripts update to 1.3.1 and Typescript update to 2.2.1. 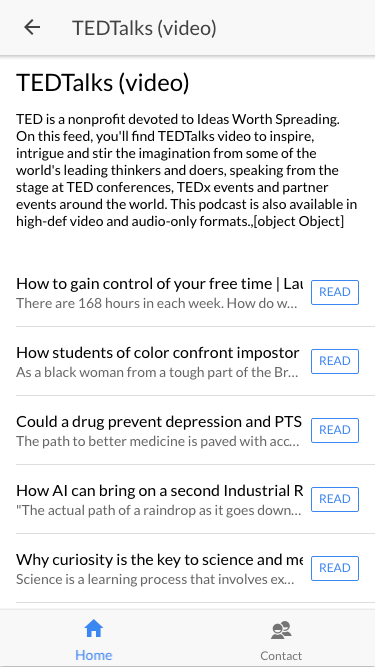 Added Feed Category support. Several updates. 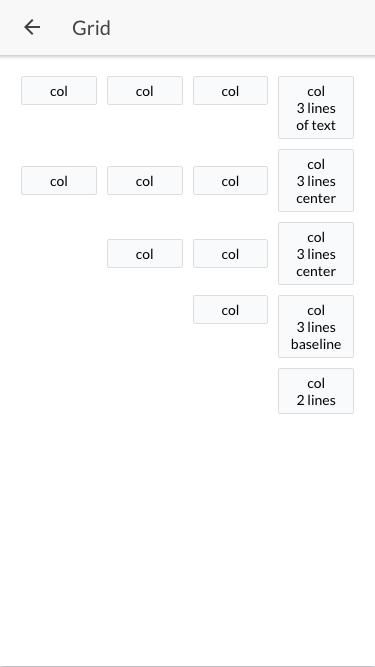 Split Pane component integration. Nav-inception integration. 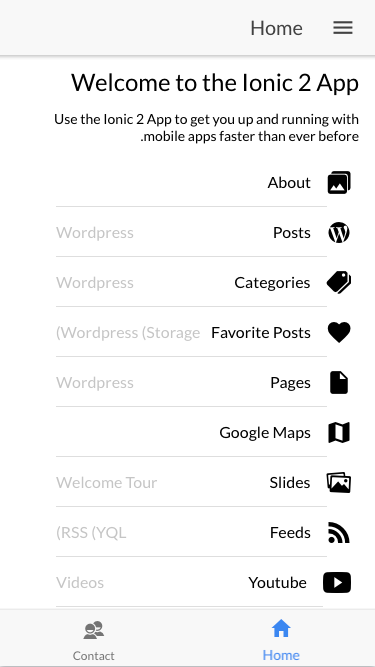 Added Wordpress Menus nested navigation support to the side content. 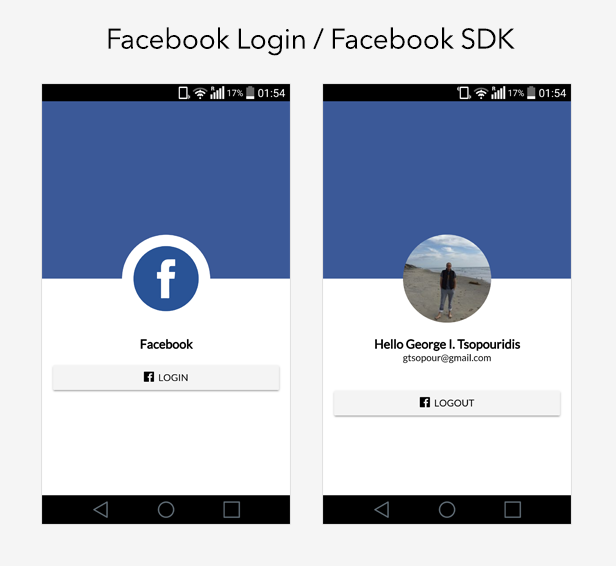 Set/Get Facebook Logged-in User to Ionic Storage. Events publish-subscribe style event system integration. 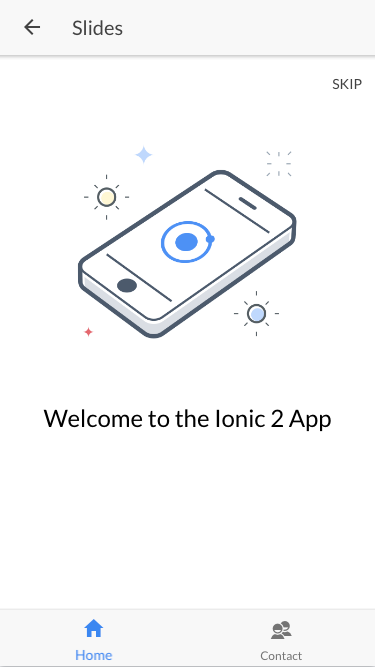 Ionic 2 Framework update to 2.3.0. Ionic Native 3.x update (installation only of the active plugins). 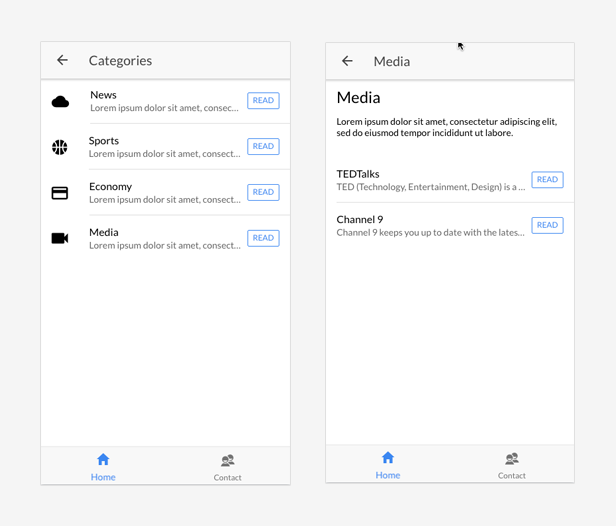 Ionic 2 app-scripts update to 1.1.4 and ionic-storage to 2.0.0. Several fixes/improvements. 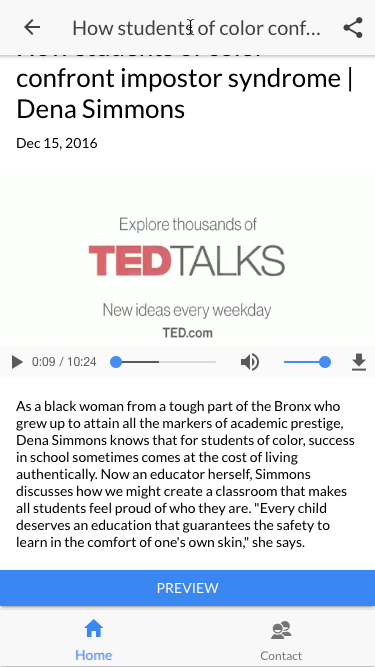 Youtube Channels integration with Youtube Channel and Channel Video Components. 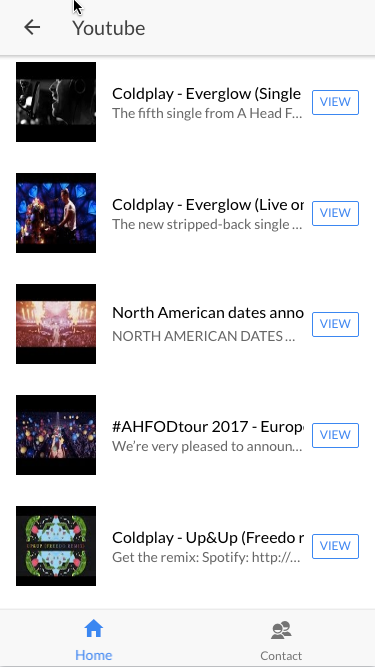 Order Youtube Videos by date. Ionic 2 Framework update to 2.1.0. Ionic 2 app-scripts update to 1.1.3. Charts integration, New Charts Module and Component (Bar, Line, Radar, Polar, Pie, Bubble, Doughnut, Mixed Charts). 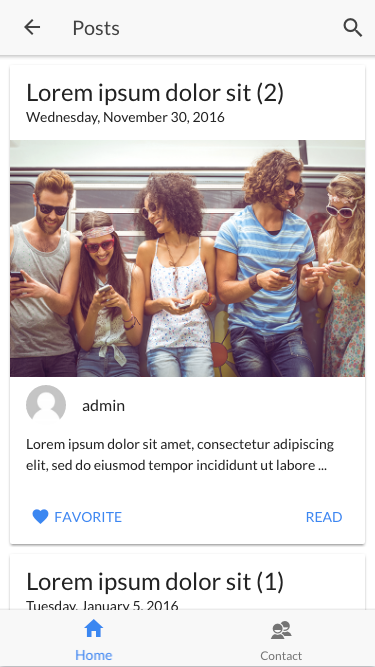 Ionic Native Email Composer integration, New Contact Form with Email Composer. Ionic 2 Framework update to 2.0.1 and app-scripts update to 1.1.0. 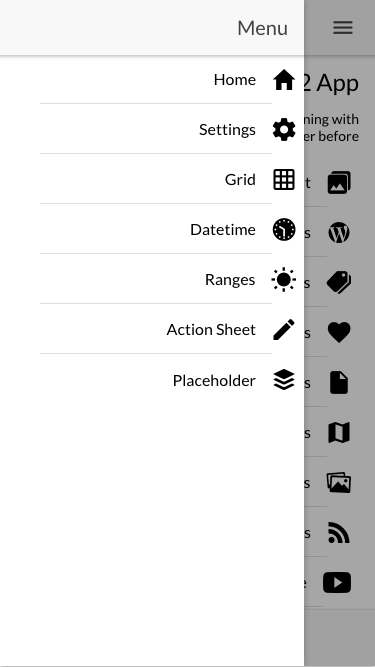 New Tutorial: How to add a Wordpress Menu <id> to the App Sidebar Menu. Wordpress Menus support (WP API Menus integration). Unlimited Menu Levels support. 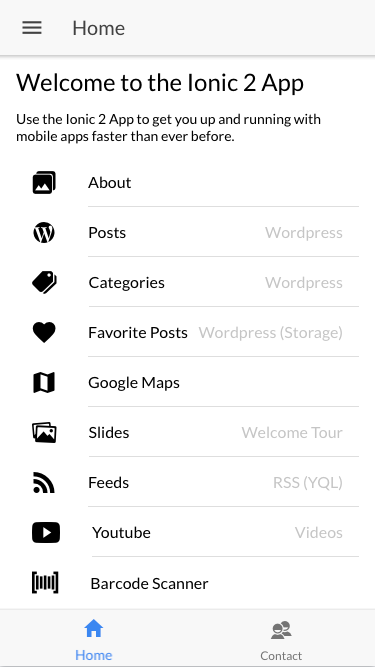 New Wordpress Menus, Wordpress Menu and Wordpress Menu Item Components in the Wordpress Module. 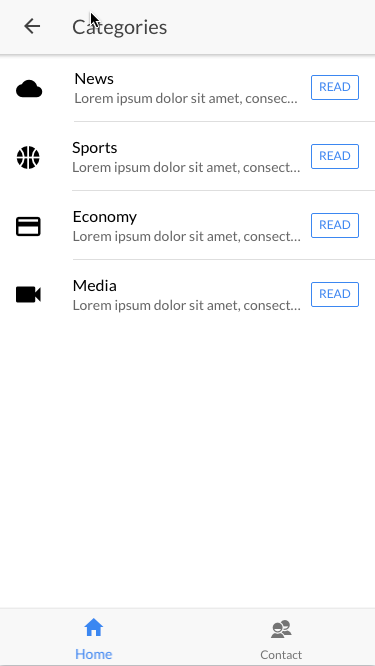 In App navigation from Wordpress Menus to Categories, Posts and Pages. New Facebook Connect Module. Facebook Login/Logout. 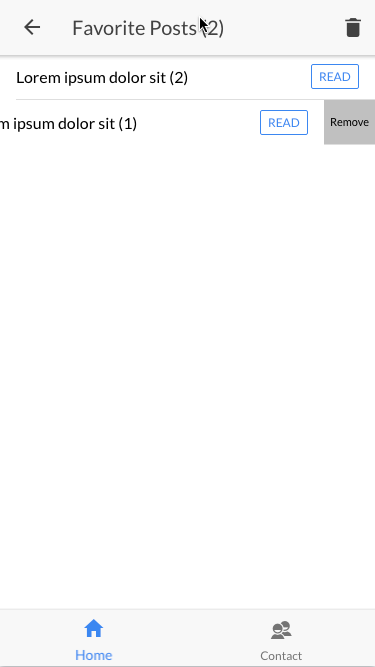 Access to the Facebook Graph API. Ionic 2 Framework update to 2.0.0-rc.5. Ionic 2 app-scripts update to 1.0.0. Wordpress Login / JWT Authentication for WordPress REST API Version 2. 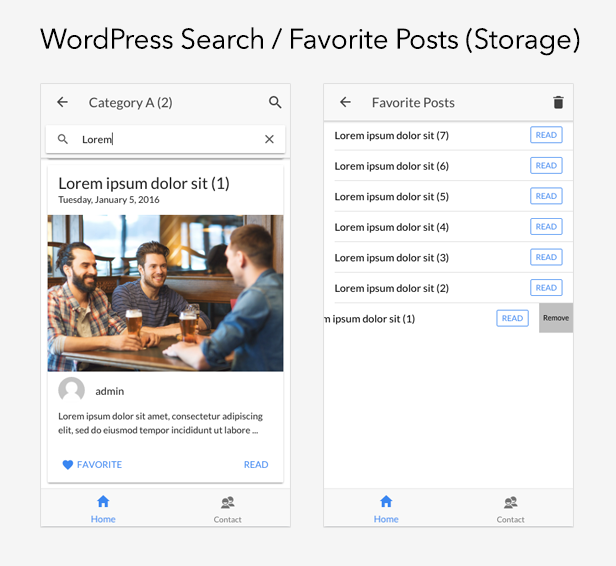 New Wordpress Home Component (modern design). New Login Module/Component. 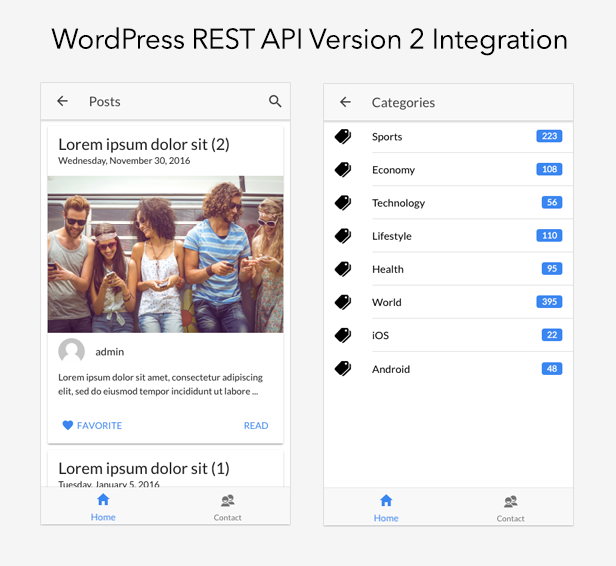 WordPress REST API Version 2 Pages integration. RTL Support Documentation. 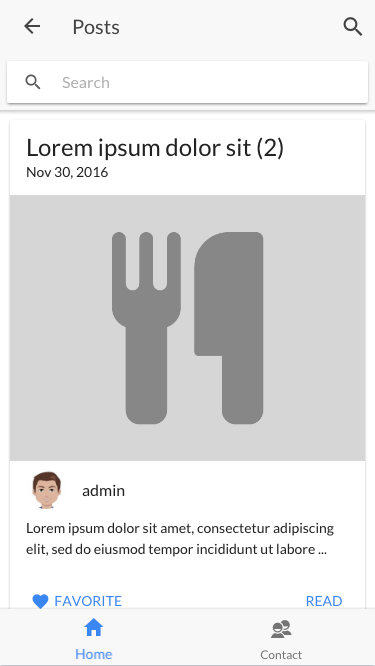 Side-menu navigation support – Menu is a side-menu navigation that can be dragged out or toggled to show. The content of a menu will be hidden when the menu is closed. 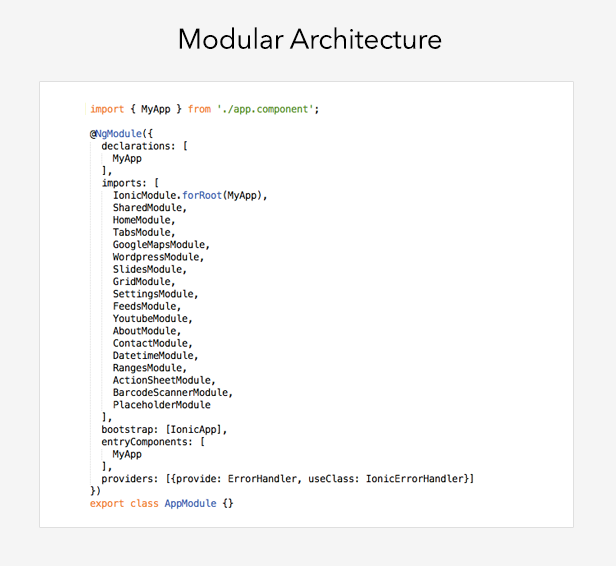 Angular + Ionic 3 Modules help organize an application into cohesive blocks of functionality. An Angular Module is a class adorned with the @NgModule decorator function. @NgModule takes a metadata object that tells Angular how to compile and run module code. It identifies the module’s own components, directives and pipes, making some of them public so external components can use them. 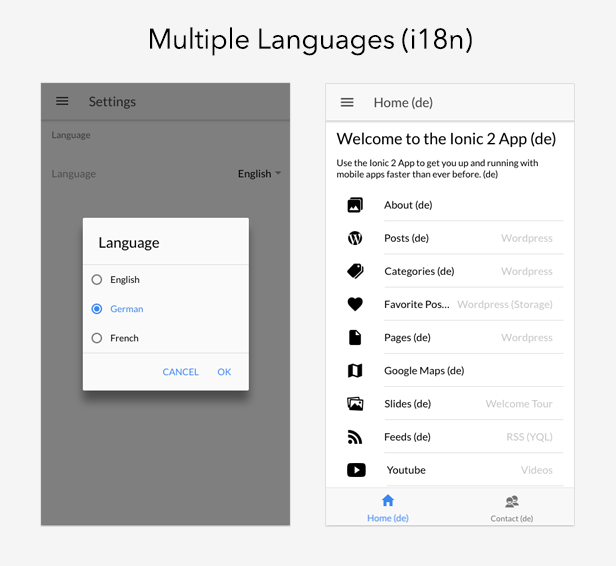 Ionic Framework App comes with Multi Languages support. 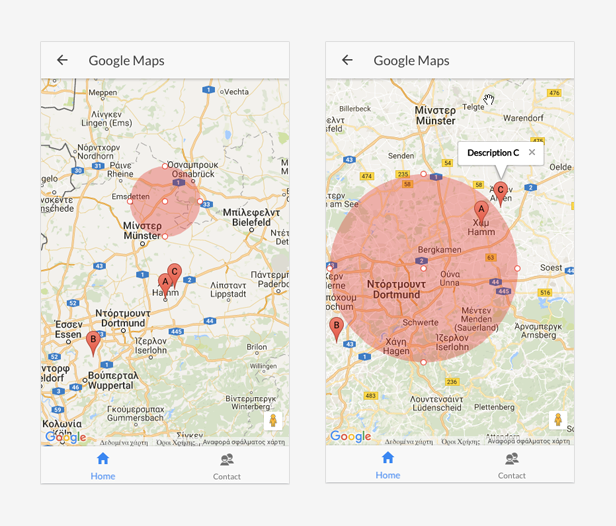 Best practices and proven techniques are packed together so as to implement a real case scenario providing by default (English/German/French) a great implementation for the Internationalization of your App. 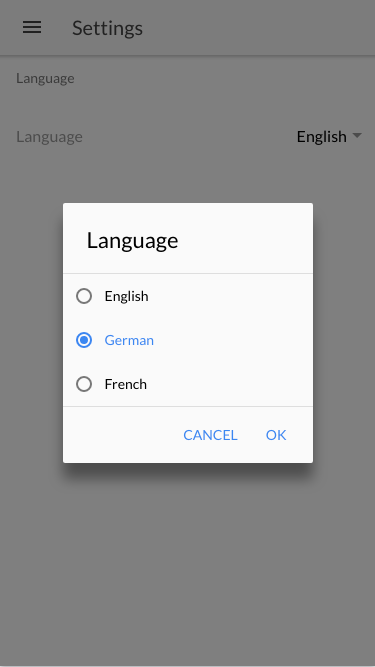 You can translate your App to multiple languages in parallel. The Ionic Framework App comes by design with the en.json, de.json and fr.json files providing you a full translation mechanism. 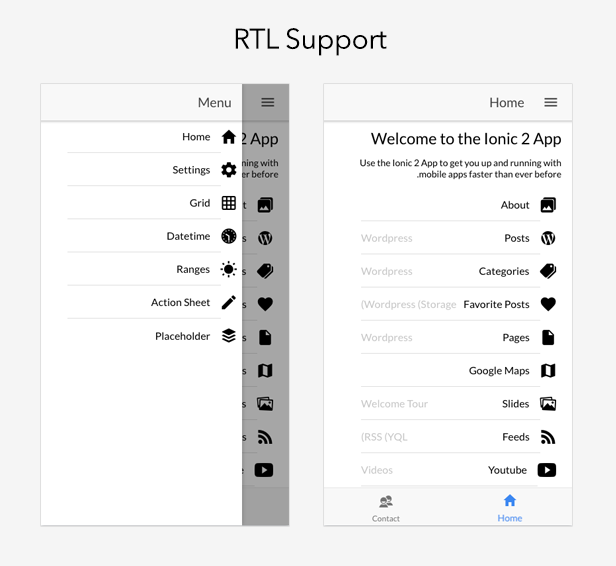 Ionic 3 and therefore Ionic Framework App comes with RTL support. Just enable the RTL by placing the code this.platform.setDir('rtl', true) in the app.component.ts as you can see below. SplitPane is a component that makes it possible to create multi-view layout. Similar to iPad apps, SplitPane allows UI elements, like Menus, to be displayed as the viewport increases. If the devices screen size is below a certain size, the SplitPane will collapse and the menu will become hidden again. This is especially useful when creating an app that will be served over a browser or deployed through the app store to phones and tablets. 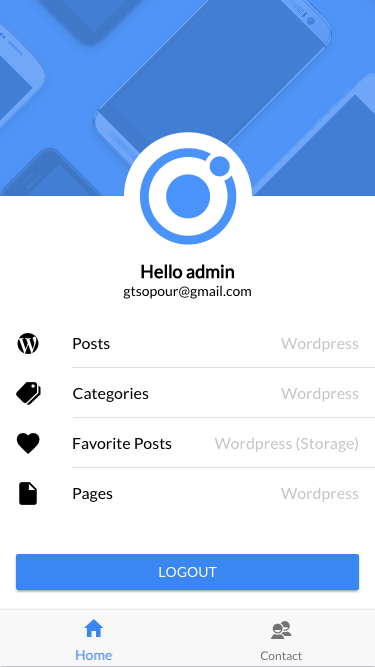 Ionic Framework App comes integrated with the WP API Menus https://wordpress.org/plugins/wp-api-menus/ through the Wordpress Menus Component, Wordpress Menu Component and Wordpress MenuItem Component in the Wordpress Module. 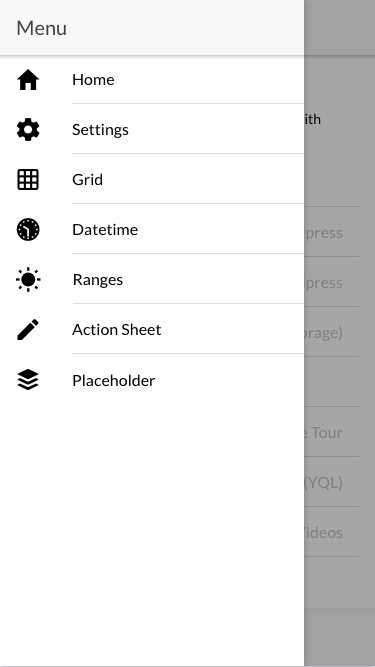 You have all your Wordpress Menus available in your App with unlimited nested levels support. 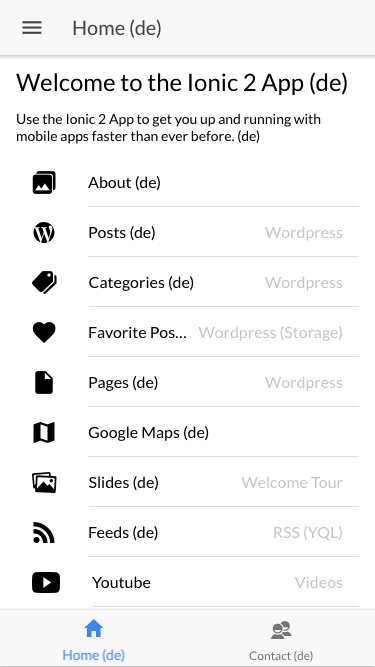 The WP API Menus extends the WP REST API with new routes pointing to WordPress menus. 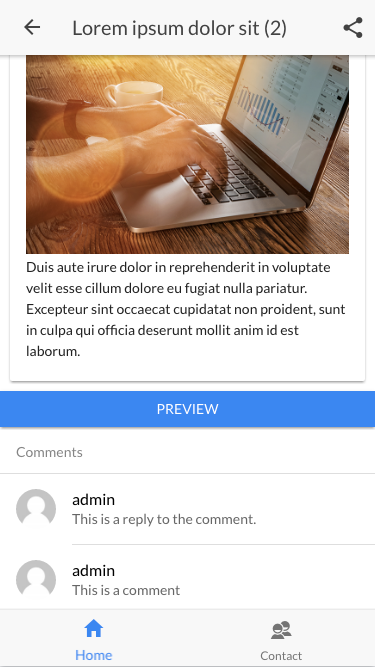 With Ionic Framework App (>=1.8.0) you have the option to add Wordpress Menus nested navigation support to the side content. Please just edit the src/app/app.config.ts file that is located in the app directory and set the wordpressMenusNavigation = true. 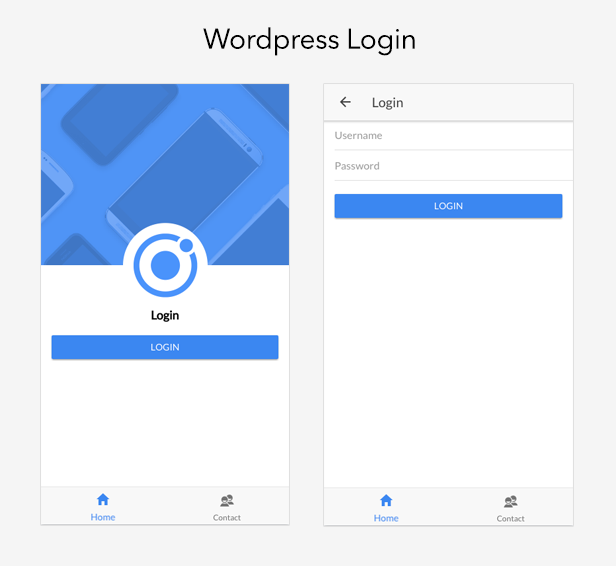 Ionic Framework App (>=1.2.0) comes integrated with the JWT Authentication for WP REST API through the Wordpress Login Component in the Wordpress Module. 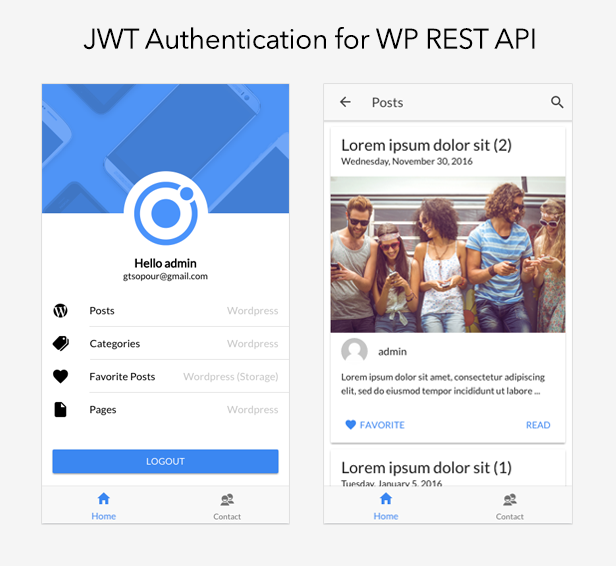 The JWT Authentication extends the WP REST API using JSON Web Tokens Authentication as an authentication method. Ionic Framework App comes with Firebase 4 Integration. 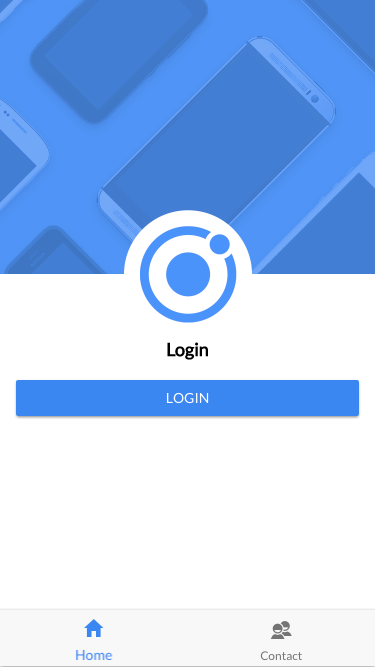 Ionic Framework App comes with Facebook Login / Logout and with a full implementation (Facebook Connect Module / Facebook Connect Component) for accessing the Facebook Graph API. 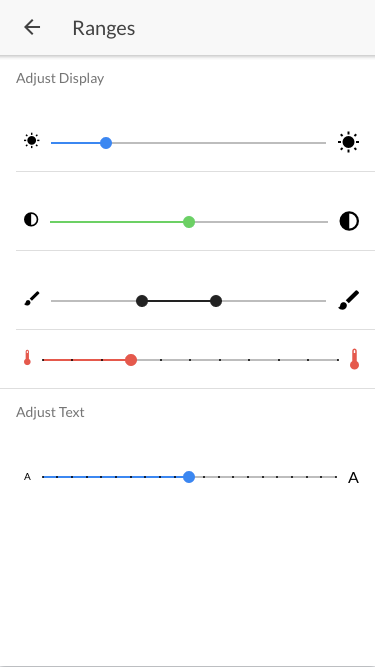 Ionic Framework App comes with Charts integration (Chart.js) and it contains also the Charts module that declaring/exposing the Charts Component. You can find also implementations of the Bar, Doughnut, Line, Radar, Polar, Pie, Bubble, Mixed Chart types in the Charts Component. 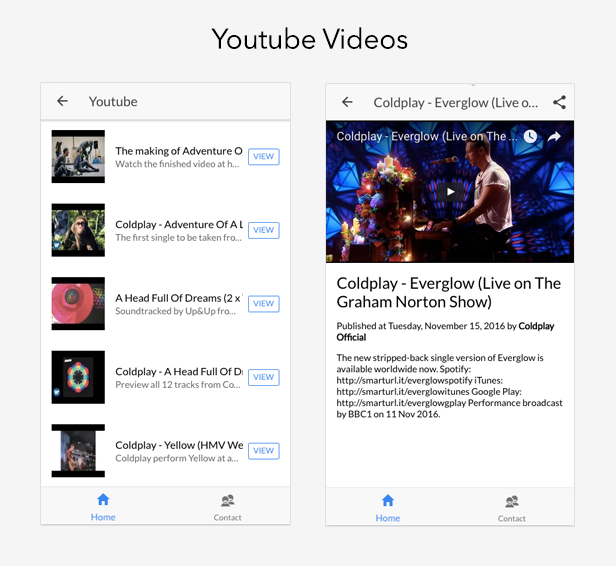 Ionic Framework App implements a Feeds Module a based on the Yahoo Query Language (YQL). Yahoo Query Language (YQL) https://developer.yahoo.com/yql/ allows you to access atom, rss, micro formats and more. YQL is an alternative to Google Feed API https://developers.google.com/feed/ as this is officially deprecated. Ionic Framework App comes with a new Contact Form under the Contact Module/Component. 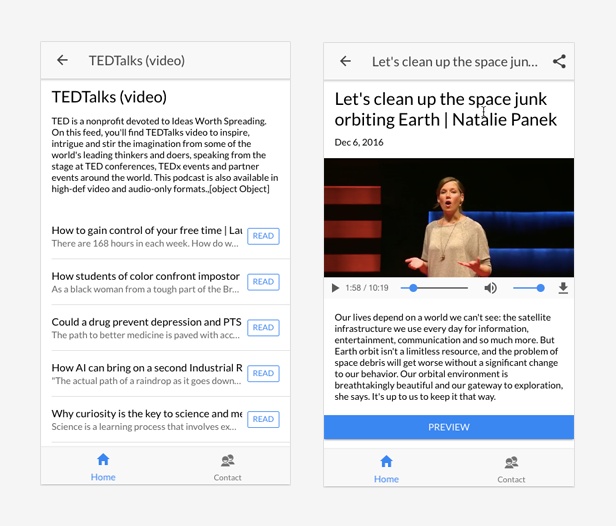 In addition, it comes integrated with the Ionic Native Email Composer in order to send directly this Email. The email recipient (Email To) could be configured to the main App Configuration src/app/app.config.ts. Please you could find more detailed installation and build instructions at the App official documentation. - Wordpress Login / JWT Authentication for WordPress REST API Version 2. - New Wordpress Home Component (modern design).